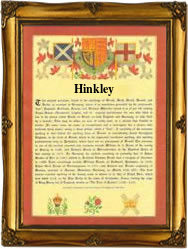 Recorded as Hinckley, Hinckly, Hinkley, and Inchley, this is an English locational surname. It originates from the town of Hinckley in the county of Leicestershire, the place being first recorded in the famous Domesday Book of 1986 as Hinchelie. The meaning of the place name and hence the later surname according to the Dictionary of English Place Names, is 'Hynca's leah,' or the farm of a person called Hynca, but other interpretations are very possible. 'Hynca' is a name found quite often in early records of the English Midlands, suggesting that it was tribal. Locational surnames are usually 'from' names. That is to say that they were names given to people after they left their original homes to move somewhwere else. The easiest way to identy such people being to call them by the name of their former home. In this case early examples of the surname recording taken from surviving church registers of the county of Leicester include: Richard Hinckley who married Ceclia Xpian at Melton Mowbray, on November 28th 1596, Symond Inchley, who was christened at Medbourne, on September 29th 1620, and Richard Hinkley, a witness at Quorndon, on December 1st 1641, during the reign of King Charles 1st, (1625 - 1649).